An eco-friendly material that once united Europe and Asia in transcontinental trade shows promise for manipulating light in biosensors and more. Fiorenzo Omenetto, a biomedical engineering professor, heads the Laboratory for Ultrafast Nonlinear Optics and Biophotonics at Tufts University in Medford, Mass., where they are using silk in brand-new ways. Since joining Tufts in 2005, Omenetto has pioneered (with Dr. David Kaplan) the use of silk for photonics, optoelectronics and high-technology applications. The subject was one of the hot topics at October’s Frontiers in Optics 2012, the annual meeting of The Optical Society. Presentations on the subject of silk were given by both Omenetto (silk from worms) and Nolwenn Huby of CNRS Institut de Physiques de Rennes in France (silk from spiders). Fiorenzo Omenetto Courtesy of Tufts University. BioPhotonics Senior Editor Melinda Rose recently enjoyed a wide-ranging conversation with Omenetto via Skype. Omenetto: Right now, we’re working on making more sophisticated structures out of silk. We’re looking at how we can really integrate some of these optical components within living tissue and trying to look at how these components – these new optics in silk – could give us information about, for example, infection or could even tell us how a drug is being delivered. BioPhotonics: There was also another group [at Frontiers in Optics], a group from France, who gave a presentation on uses of spider silk. And your group uses silkworm silk. What’s the difference between the two types of silk? Omenetto: There is a little bit of a structural difference, but the main reason why we do use silkworm silk is that we have a lot of it available – there’s not a lot of spider silk available today. Spiders are not the friendliest creatures, actually, to have produce a lot of material. So, silkworm silk being a commodity material is very advantageous to us, and with the postprocessing – with melting the silk and going back to the silk solution, and then using that as our starting point, we can actually get materials that mimic, in a certain sense, the spider silk behavior, by processing what we have. Omenetto: Yes, that could hurt! BioPhotonics: Are there any limitations in the silk that you get from your materials, in terms of making it for a mass application? Omenetto: Well, I think that, for now, we’re OK. The current status of the industry is that silk is a commodity material, and so there is an immense quantity available that is geared to the textile industry. Now, if we go toward devices and we think about devices that are going to be pervasive, like – I don’t know, like cellphone screens – then that’s a different story. Then probably we’ll use some biochemical synthesis, or artificial synthesis methods have to come to our rescue. 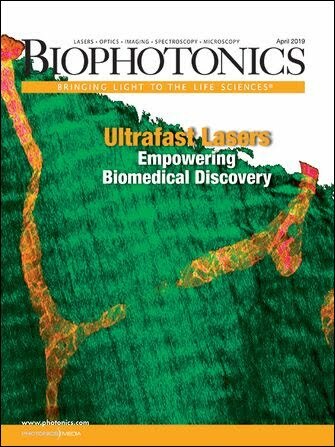 BioPhotonics: What do you see as being the first practical application of the technology, and could you show us any items in your lab that you’re working on right now? Omenetto: I think that, in effect, some of the nice applications that we’re working on have joined not only optics but also electronics, so it’s a combination of materials that can be implanted and then gradually resorb over time and disappear. And so the things that we’re working on are, for example, implantable heaters that come from a combination of, say, a wireless receiving coil that is built on a film of silk, that then goes under the skin and heats up on command and mitigates infection at its implantation site. By the same token, right now we’re working also on optical relay systems; for example, on reflectors, silk reflectors that can be implanted and then send back more optical information when they’re left under the skin, for example, and then interrogated from the outside with an ordinary light source. BioPhotonics: What do you think will be one of the first applications we might see, and how long do you think it might be before we see it? Omenetto: One of the advantages of silk is this way of interfacing with living tissue. Anything that becomes an implantable medical device then has to go through a regulatory process. So, whereas the prototypes are in a reasonably advanced stage right now, the regulatory path is going to be followed, and so that has generally a fairly long time – I would say five years, maybe, or something like that. BioPhotonics: So some of the systems that you’re working on that would be topical, rather than inside the body – we might see those first? BioPhotonics: What is it that makes them so biocompatible with the human body? Are these proteins that we have in our bodies? Omenetto: There’s actually a long history of biocompatibility with silk. Silk sutures have been used for a long time – for over a hundred years, in fact – and they still remain a very widely used suture. The difference between the sutures and our material is that we actually clean up, somewhat, our material: The sutures still have sericin, which is the glue that kind of holds together the two fibers that are spun out of the caterpillar. And then these sutures are waxed, in general, so they actually elicit an inflammatory response. We remove the sericin in the process of [making] our liquid silks, in the process of extracting the fibroid, and it turns out that then the protein is very noninflammatory. And there are a lot of explanations that are due to the extreme hydrophobicity of the protein, to the way that the materials are processed, and to how they degrade, and so forth. BioPhotonics: Do you have any examples? Perhaps some prototypes that you could show us? Omenetto: The thing that I always show is an old diffractive optics card that was distributed at trade shows – at CLEO, in fact – and you can see here a bunch of microlenses and phase masks, and this is an old DigitalOptics polycarbonate card, but this is 100 percent silk. BioPhotonics: So the fact that you’ve used these for a couple of years now means that they’re fairly durable? Omenetto: One of the remarkable properties is that you can tune the way that the materials last or degrade through the chemical crosslinks when the material is formed, so the more chemical crosslinks, the stabler the material and the less degradable it is. And if the protein then goes from its liquid to its solid state without forming these crosslinks – so, without forming beta sheets – then the material will melt in water. So you go from instantaneously degradable to very stable. BioPhotonics: So what does your lab look like? Do you have a lot of these cocoons hanging? Omenetto: [laughs] We have a lot of boxes that are full of cocoons. We have a few of the caterpillars, too … but mostly we get our cocoons from Japan or China, from Cambodia. BioPhotonics: You’ve said before that in addition to being water-soluble and biocompatible, this material is also edible – so what does it taste like? Omenetto: Well, how do I politely answer that? It needs some barbecue sauce. BioPhotonics: And do you envision any applications where people would actually eat this for any reason? Omenetto: [laughs again] It really tastes like nothing. It’s a little bit bland; it’s a bit chewy. Some of the applications – we did some work with antennas, where basically we put on a film of silk some split-ring resonators. And the split-ring resonators would interrogate or monitor what happens on the surface. So the idea there is that the resonators are made of gold, which is basically edible, and it’s kind of like gold leaf in a fancy restaurant. And so, instead of having just the gold leaf as garnish on food, we shape it as an antenna. And we put these appliqués on cheese and on fruit and on whatever, and you could eat the sensor along with the food. BioPhotonics: So would that be to determine whether food had gone bad, or something like that? OOmenetto: For example, yeah. We have some examples in which we detect bacteria on the surface of cheese, the ripening of a banana – which I’m not advocating is a very useful thing because we can all see a banana turn dark, but it was more to prove a point. And with some colleagues we’ve also done work on bacterial sensing on teeth, applying the silk films with the antennas on the enamel. BioPhotonics: But the electronics and possibly the nanoantenna applications of the products, we might see those first because they don’t have the rigorous FDA kind of approvals to go through? Omenetto: Perhaps. I mean, all these various applications have their own idiosyncrasies, in terms of bringing them to market, so I think it’s reasonable to expect that for nonmedical applications, your time to a product might be sooner. BioPhotonics: Maybe five to 10 years? Omenetto: I think five years is a good ballpark. A video of the complete interview can be seen at www.photonics.com/LMSILK. can the silk gland from a spider be transplanted into a silkworm?